This is the prestigious book of Andhras in general and people residing on the banks of River Krishna in particular. It is a known fact that in olden days, separate treatises were written on all the Eight branches of Ayurveda by Salakya, videha, Kankayana, Gargya, Galava, Satyaki, Bhadra, Sounaka, Karaja, Cakshushya, Krishnatreya, Katyayana, Nimi etc., they are all now exinct. About the Book: This Netra darpanamu is the only book written exclusively on Eye diseases in Telugu poetry. 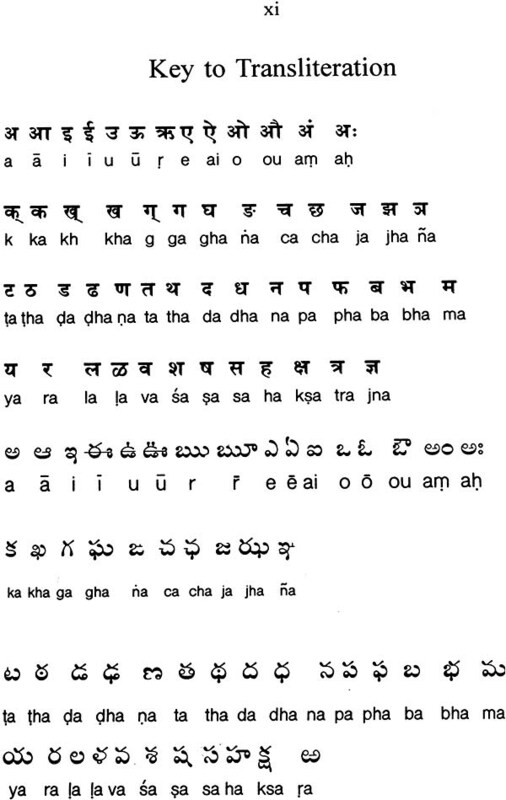 This unique work in Telugu was first published in 1908 in Eluru and republished in 1915 & 1926. After a lapse of 58 years I got it serialized in Indian Medicine House Journal in 1984 to draw the attention of the Vaidyas of Andhra Pradesh. It is the general opinion, as I could gather, of the Ayurvedic fraternity, that it is very difficult to treat eye diseses through Ayurveda. I would like to draw again the attention of the such Vaidyas, to Sudarsanam Netra cikitsalaya of Kuttt Krishnan Nair of Tiruvalla and Sreedhariyam eye hospital in Kerala State. These hospitals provide successful treatment for many eye ailments which modern medicine could not treat. If one or two practitioners make a bigining, all the others follow it. We need few such devoted vaidyas. Central Council for Research in Ayurveda recently published in 1999 tow small books-Netra roga Nidanam and Netra prakasika. these were said to be the translations of manuscripts in Tamil available in Tanjavore Library. It is necessary that these are compare d with the present Netra darpanamu to assess its uniqueness. Name of the Book: In 8th poem, the author had clearly mentioned that he is writing the book Locana Darpanamu. But, the book has become famous as Netra darpanamu. Probably, Locana and Netra are synonyms, and the word Netra is easy to spell, it could have become popular. All the three editions were printed as Netra darpanamu only. Contents: As regards the contents of the book, genology of the author, types of treatments etc., have been described in 26 poems, followed by 35 recipes. The author, have said there are nine types procedures viz. 1. Bandages 2. Plasters 3. Regimen of food and behaviour 4. Collyriums, 5. Snuffs, 6. Oils, 7. Medicines that break the progress of the disease, 8. Medicines that cure the disease and 9. Glasses in 19th poem. But, the author had only described the first four. This leaves a doubt, that the book is incomplete. But, I personally fell that the author had described only these four in which he has expertise. Further, author had said that there are 96 types of eye diseases and are being furnished. But, only 89 have been given. Out of them there are repetitions with synomyms in Sanskrit. But, while dealing with the indicated diseases under the 35 collyriums described, the names of the diseases have been given mostly in Telugu. Correlating these old Telugu terms with sanskrit and then to English is difficult. It is seen from the first edition of 1908, that the original text in Telugu Poems were got translated by Sri Kothapalli Sundararamaiah into Telugu prose. There are few mistakes in it for example - Rasanjanam was translated as Ingilikamu (Cinnabar) and Kaphari as Palatuthamu etc. Author & the period: The genology of the author and the place he belongs are described in 4th, 5th & 6th poems. The author is Tadipalli Panakalaraya, a devotee of Lord Visnu, belonging to Tadepalli on the banks of River Krishna near Vijayawada. Only the Prakasam barrage separates Tadepalli and Vijayawada. The period of the author also could not assessed. Since Tadepalli lies in the Kingdom of Kondavidu, kingdom. It is noteworthy; the use of Glasses was indicated by the author. Since, use of glasses for refractive errors, is of recent origin, the period of the author can approximately be assessed. Being the devotee of Lord Visnu, most of the poems were ended addressing with the synonyms of Lord Visnu. These synonyms were not translated as they are not essential for the subject matter. The name of the author Panakalarya is the synonym of Lord Nrusimha, of Mangalagiri (See poems 5 & 6) incarnation of Lord Visnu. Acknowledgments: I thank Central council for Research in Ayurveda and siddha (CCRAS) and the Dept. of AYUSH for promoting publishing of translated version of useful books written in regional languages. I thank Vaidya Sri M. Ramasundara Rao, Former Principal of Dr. N. R. S. Govt. Ayurveda College, Vijayawada for editing and providing the modern equivalents to diseases and symptoms mentioned in the book. Hope that this English translation will help all Vaidyas not only throughout India but in other countries too, to start Eye Hospitals of Ayurveda to bring back the glory of the great science. I have also compiled all the available formulae of Anjanas and is waiting for patronage. It is the opinion of some of the well read qualified Vaidyas, not having the experience in treating eye ailments; comment that applying collyriums, containing black pepper etc., is barbarious and should not be promoted. It is the experience of the Vaidyas of yester years, that they work wonders. It could be noticed that almost all the 35 collyriums described in this book contain one or more pungent drugs, which create unbearable burning sensation in the eyes when applied. These are to be treated as mild surgeries. Vijayawada. The commentator of this book Vaidya Sri Pammi Satyanarayana Sastry garu has taken up a noble task of bringing out the hidden treasures of Ayurveda by translating several Ayurvedic texts which are out of print today any where in India. Once upon a tie, those books were very popular, but unfortunately, due to lack of royal patronage and Governmental support, nobody could venture to publish such books. Recently, Vaidya Sastry garu has brought out a book in Telugu by name Maruguna padina andhrayurveda Granthalu. The present generation has not atleast heard the names of those books. The author, who himself is possessing all those Telugu books either in the form of manuscript or printed books has given an introductory note of about 40 books and very informative article on Kosa/Nighntu granthas in Telugu, with an aim and hope of bring them into light. One among them is the present Netra darpanamu, written by Vaidya Tadipalli Panakala Raya. Now, the book is in your hands with the author's original text in Telugu duly transliterated in English in diacritical font, to enable all to read, and sri Sastry's commentary in English. The book requires some more investigation to find out whether any more material is available which might probably be missing because of a long communication gap. The author in the preamble of the book declared that he would given the details of 1. Bandages 2. Poultices 3. Anjanas 4. Medicines 5. Glasses (Spectacles) 6. Surgical procedures 7. Nasyas 8. Pathyas 10. Apathyas. Out of these 10 headings, he wrote only about Pathya apathya, and Anjana and mentioned in brief about bandages and poultices. He totally ingnored the remaining. While the number of eye diseases, enlisted by the author was 89 as against 96, contrary to what has been mentioned in the preamble. Even in these 89, three are four diseases are repeated twice or thrice. Andhras are very famous in preparing anjancs in a traditional way. Even to-day we find some of our grandmothers preparing anjanas at home for their grand children. Vagbhata yogas. In this the ingredients are collected in the form of lamp black after burning them and that microfined powder is again made into 'Kajal' by grinding it with honey or castor oil. In the present text most of the anjanas are found in the form of dry sticks. These sticks have to be rubbed on whetstone by adding breast ilk or water or honey and should be applied to the conjunctiva at the outer canthus. 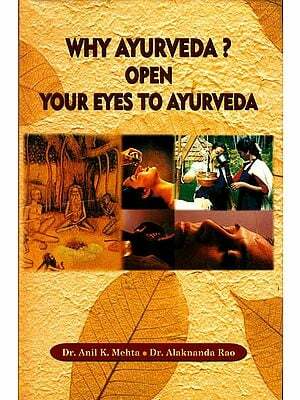 The author has described most of the anjanas claiming cure of Corneal ulcers & cataracts. This requires a great research to prove or disprove their efficacy because, till to-day there is no medicinal treatment at all for these diseases in any system of medicine. 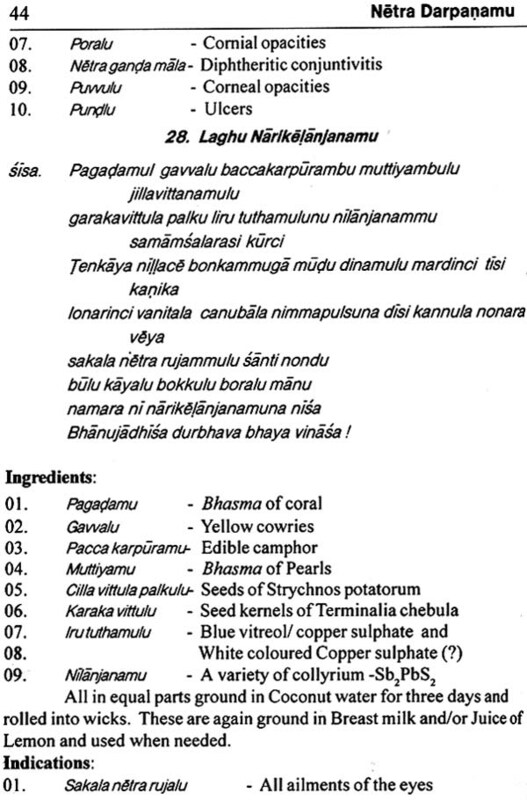 In some of the formulae, the author has mentioned Harati karpuramu. This, to-day means, the camphor which we use in worship and religious functions. As on to-day, this camphor is not healthy for eyes, since it contains naphthaline. Most probably the author might have meant Pacca karpur or Bhimaseni karpur which in English called Borneal. This is proved to be a best anti-inflammatory and anti-septic for eyes in a dilution of 1:16 or more in water or Rose water. 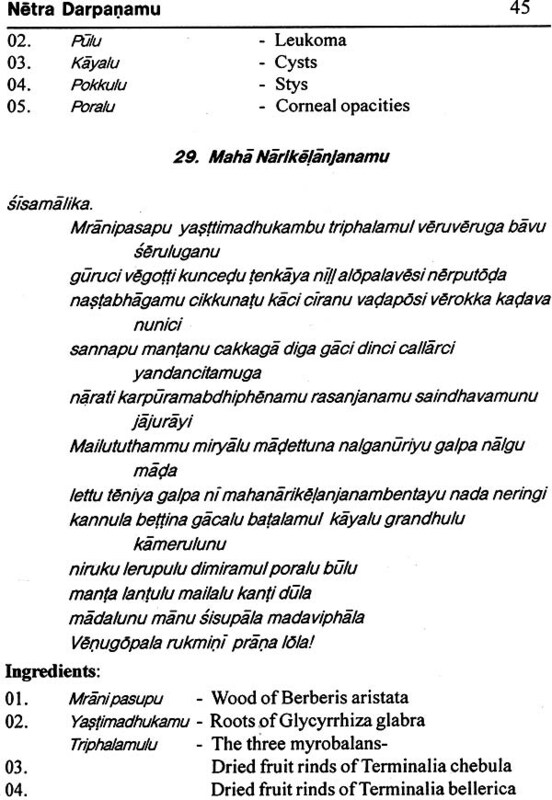 The Commentator has tried his best to translate all the diseases mentioned in the original Telugu text, but it cannot be taken as confirmative and authoritative translation for the Telugu terms because, the nomenclature used by the author is somewhat ambiguous as, most of the names of the diseases appear to be folklore names, such as Madalu, nasimirulu, nasalu etc. 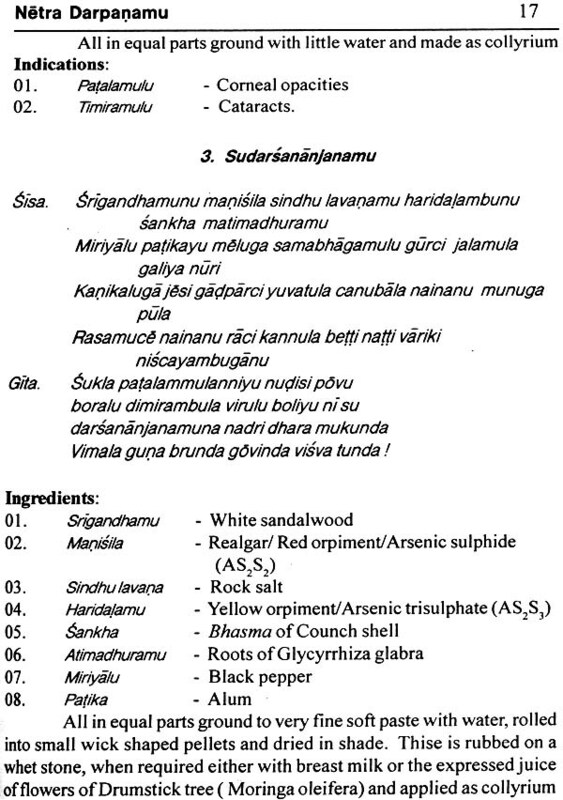 Such terms are not found in any text of Ayurveda in Telugu or tatsamas in Sanskrit. Since, author has mentioned the term addamulu which means glasses (Spectacles), the book might have been written after 15th Century AD. Lastly, I must say, the book is incomplete, the reasons for which have to be investigated by the young generation. I whole, heartedly congratulate the efforts taken by Sri Sastry garu, in bringingout this book in the fashion, you are seeing it now. I wish him all success.